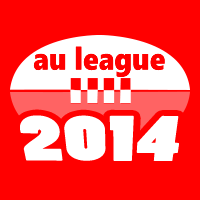 The perfect app for Australian Rules Footy Fans! 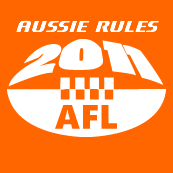 Keep track of the current AFL 2011 Season - complete with Latest Scores, Round-by-Round and Team Fixtures, latest News (for both the entire competition and your club). Nominate your team - and instantly view upcoming matches - complete with Venue details (and Interactive Microsoft Bing Maps). The latest update has made this app a winner. Woohoo live scores now within the app!! Loving it keeping tap on FREOOOOooooo!!!! The update is excellent, app was pretty good before, really like it now. Keep up the good work. Great app. Excellent use of the WP7 UI, Bing maps etc. 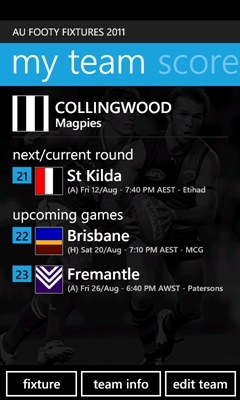 Go Pies! 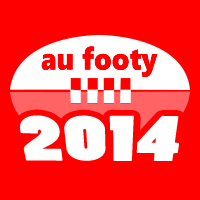 Nb: Above rankings/awards for 'AU Footy Fixtures 2011' are at time of updating this page.